April Showers in July » What's Under the Needle? July has been a very creative month for me. I've been working on a number of different designs. Earlier this month it was a Bargello and this week something completely different. One I have named as "April Showers". 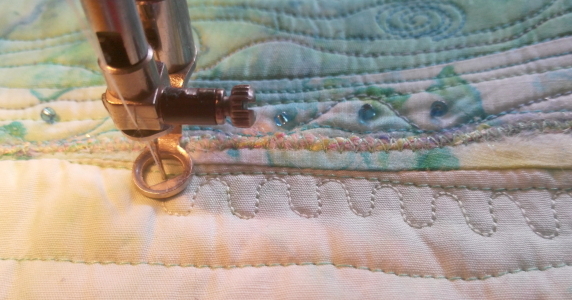 Here's a sneak preview showing off some of the colors and stitching I've been doing. Intrigued? Want to see the entire quilt? Be sure to sign up for our newsletter to be the first to hear more about the release date of this unusual, colorful and creative pattern. Sign up box below! Coming up, I'm planning an August Blog Challenge starting August 1st, work from your stash and following the instructions - it's that easy. How about joining me? Recieve a free poppy pattern with the latest updates (and deals) when you sign up for our weekly news.